Catherine Haddad Staller (USA) was stationed in Germany from 1993 to 2012 where she represented the United States in competitions throughout Europe at both national and international levels. She achieved numerous results from materials level through Grand Prix on various mounts. With Maximus JSS, Cadillac and Winyamaro, she accumulated over 120 top ten placings and wins at Grand Prix. In 2006, Haddad Staller was alternate for the US Dressage Team in Aachen at the World Equestrian Games. In 2007 she qualified as an American dressage rider in the Western European League for the World Cup. 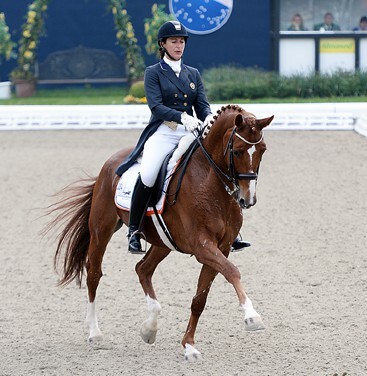 With Maximus JSS, she finished seventh at the 2007 FEI World Cup Finals in Las Vegas. In 2009, Haddad Staller won 9 Grand Prix with Cadillac and Winyamaro in European competitions. In 2010, she was Reserve for the US Dressage Team for the World Equestrian Games in Kentucky and won the CDI-W at Dressage at Devon which helped her achieve a nomination to the FEI World Cup Final in April of 2011. Winyamaro and Cadillac went on to win two tests in the USA at the Saugerties CDI-W/CDI3* in New York, September 2011. Haddad Staller returned to the USA in 2012 and now runs training facilities in Califon, New Jersey and Wellington, Florida. Her current Grand Prix horse, Mane Stream Hotmail placed in the top ten at numerous international competitions both in the USA and abroad in his first year of Grand Prix. Haddad received a B.A. from James Madison College at Michigan State University in 1987 and graduated with Honors. She is a recipient of the BHSAI certificate from the British Horse Society and has been awarded with the German Gold Medal for Dressage and the USDF Gold Medal. She credits Willi Schultheis, Rudolf Zeilinger and Morten Thomsen for her dressage education.